A recent article in the Proceedings of the Royal Society of London addressed the issue of the use of calcite as a Viking Sunstone. The authors mentioned Leif Karlsen, but apparently were not aware of the full extent of his work on this subject, nor that he had demonstrated this very thoroughly many years earlier. The response below is adapted from the follow up note on this subject published by the Society. 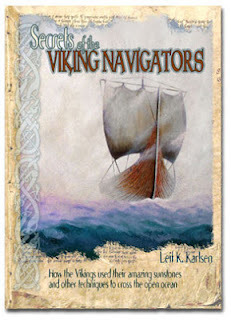 Leif's work is described in Secrets of the Viking Navigators. Abstract: Attention is drawn to the related work of Leif Karlsen. A main conclusion of this work by Robars et al. is that a piece of Iceland spar (optical calcite) can be used in a simple manner to ﬁnd the direction to the Sun using polarized light, even when the Sun is obscured by clouds or just below the horizon, which supports the possible role of the renowned sunstones discussed in Viking Sagas. They propose a method of using an opaque spot on the incoming face of the crystal as a means of detecting the proper orientation of the crystal when aligned with the azimuth of the Sun. They also point out that a recent discovery of a calcite crystal in an Elizabethan shipwreck near Alderney in the Channel Islands might have been used for navigation in a similar manner. I ﬁrst express my appreciation that this line of research and analysis has been brought to the attention of the scientiﬁc community and, indeed, to the public at large, as their article received much attention in the popular media, worldwide, as would most news related to Vikings. I wish to point out that the authors may have overlooked the signiﬁcance of the pioneering work on this subject by the late Leif Karlsen. Although Karlsen worked on this subject extensively for the last 20 years of his life, and his work was well known among those specializing in Viking navigation or special uses of crystals, his work was not published in standard scientiﬁc journals. His main report of this work is in his book Secrets of the Viking navigators—How the Vikings used their amazing sunstones and other techniques to cross the open ocean (Karlsen 2003) and later in the Navigators Newsletter, quarterly publication of the Navigation Foundation (Karlsen 2006). It was also reported in my book Emergency Navigation (Burch 2008). Karlsen’s book is in an unusual format, which could account for the oversight. In part 1, Karlsen presents a ﬁctional account (on the basis of his extensive study of the Sagas) of a typical Viking voyage, including a narrative on navigation instruction to a new navigator. In this format, he presents (i.e. p. 26) his concept of the practical applications and use of the sunstone. In part 2, he describes what he learned to be the key steps to precise, reproducible results, with a summary that the Sun’s direction (in good conditions with a good crystal) could be obtained to a precision of one degree. Only at the end of the book in the appendix does he discuss speciﬁc results with sunstones and his own studies. His discovery, years earlier, of how to make the measurements using what Ropars et al. call an ‘opaque spot on the entrance surface’ is the key to the Karlsen measurements. Karlsen used a 3-mm square piece of opaque plastic electrical insulating tape. (Vikings might have used a drop of pine tar, in common use in boat building.) He also developed a simple apparatus for achieving precise bearings by mounting the crystal over a mirror, all of which is mounted to an azimuth ring on ball bearings, with sighting vanes at the two ends of the crystal. His original instrument has been on display in the Icelandic Room of the Nordic Heritage Museum in Seattle since 1998. Vikings would not have had access to mirrors or compasses to aid the measurement, but would have looked up to the sky through the crystal, as mentioned in one of the Viking Sagas. Much of his original data are still available. In short, he used his apparatus to locate a point on the horizon that coincided with the direction of the Sun at a speciﬁc time as he determined it with his sunstone. Then he would use a precision compass to measure the bearing to that point and then compute the Sun’s bearing at that time from the Nautical Almanac and compare them. The key point in this process is the compass bearing, which must be done carefully and with conﬁrmed lack of external inﬂuence. As a ship’s ofﬁcer for 40 years, he was well aware of accurate compass work and made all appropriate checks. The best of these data are for very low Sun positions or just below the horizon, and for these the average he reported was about ±1◦. I would stress, however, that it is not his reported accuracy itself that highlights his work, but rather his clear proof that his method was a viable one for practical use. He travelled throughout Scandinavia and the USA to demonstrate his method to Viking experts, mineralogists and museum curators. He even demonstrated the method underway on Viking replica vessels, on typical Viking voyage routes, and he received much acclaim for this work. Though not the method he used, for more casual measurements using a clear crystal, a reproducible direction of ±10◦ or so is easily demonstrated by looking up through the crystal using the crystal shape for orientation. This level of accuracy would be valuable to primitive or emergency navigation. I believe that the sole reference to Karlsen’s work in the cited paper that reads ‘... as earlier qualitatively observed (Karlsen 2003; p. 10)’, is not representative of the extensive, careful work that Karlsen accomplished over many years, which was subsequently veriﬁed by several independent observers, and thus I wish to add this note to their publication. Further to Leif Karlsen’s contribution, I would add that the reference made in 2011 by Ropars et al. (2011) to the recent Albernady discovery was actually reported for the ﬁrst time in Leif Karlsen’s book. The discovery came coincidentally at the very time of the ﬁnal preparation of his book in 2002, but more to the point, it was Karlsen who put the pieces together to ﬁrst conclude that this particular discovered crystal might have been a sunstone used for navigation. Karlsen’s book includes a photograph of the discovered crystal and the diver who found it. For completeness, I note that Karlsen was not the ﬁrst to propose a black-spot method for calcite. Ramskou (1969) describes the method for calcite in 1969 (using a side of the crystal for reference), but did not report measurements for calcite at that time. He did report results for cordierite (iolite), which were made from a DC-8 aircraft, presumably using a different method suitable to iolite. I stress that this note addresses only the referencing of the black-spot method in the Ropars et al. paper, not their hole-in-screen or Haidinger-brush methods. Burch, D. 2008 Emergency Navigation, 2nd edn. Camden, ME: McGraw Hill. Karlsen, L. K. 2003 Secrets of the Viking navigators: how the Vikings used their amazing sunstones and other techniques to cross the open ocean. Seattle, WA: Starpath Publications. Karlsen, L. K. 2006 Viking navigation using the sunstone, polarized light, and the horizon board. Navigator’s Newsletter. J. Navig. Found. 93, 5–6. The original of this comment and referenced documents can be found at the Proceedings of the Royal Society. Most Northwest mariners will eventually head up the inside Passage to Alaska or at least to the beautiful inland Canadian waters of the Inside Passage, not to mention trips to the Gulf Islands, just northwest of the San Juans, and for these ventures we will need charts. Canadian paper charts serve well, indeed, some mariners even are biased toward Canadian paper charts when they have an option of US or CND. Obtaining and using these are the same as always. Catalogs work the same, prices about the same, and outlets the same. What is dramatically different once we cross the border, however, is the use of echarts, which is more and more a part of our routine navigation–or at least it should be considered if not yet done. Even if one does not choose to navigate point to point by ECS (electronic charting system), echars remain extremely valuable for route planning, since many ECS include one button display of tides and currents–some will even pull in the latest weather map and forecasts. The big difference for US mariners is, unlike the US NOAA echarts, which are all free of charge, Canadian echarts are not free. Being not free, also means they are encrypted, which adds a layer of complexity to their use. Another layer of complexity is the new generation of echart programs from Nobeltec and MaxSea called Time Zero do not run standard format echarts at all, which has pros and cons for users and suppliers. If we were all running Macs, we would be accustomed to this control for the sake of conformity–it is not all a matter of revenue. Otherwise, modern echart programs like Coastal Explorer, Memory-Map, and OpenCPN will run echarts from any source. Next we have the common decision to make that applies to all echarts: Do we want raster charts (called RNC), which are graphic images of the actual printed charts, or do we want vector charts (called ENC), which are essentially formulas for the various components of the chart, which are then drawn on the fly as the ECS displays them. There are pros and cons to each, which we discuss in a forthcoming post. 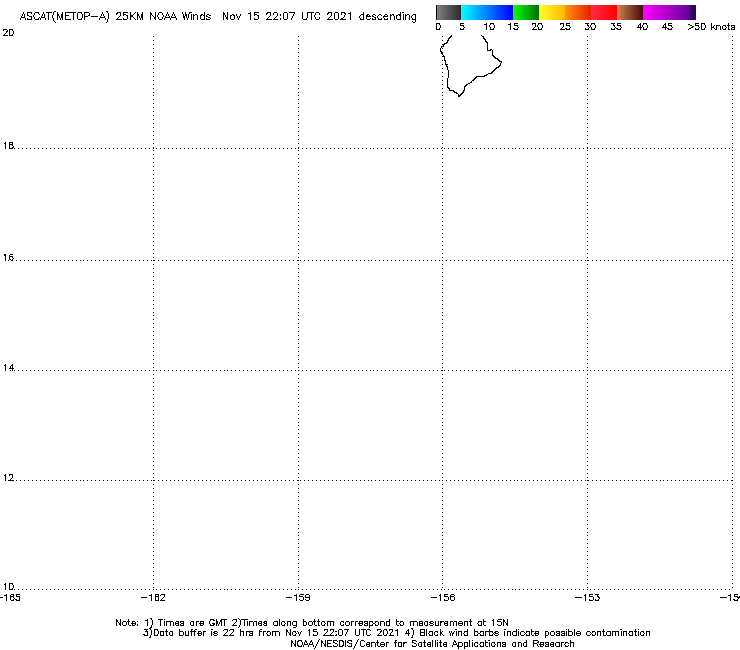 I would venture to say that most mariners entering into the use of echarts for the first time will prefer the RNC, since they look like the charts they are used to. If asked, that would also be our strong recommendation. RNC are large files; Enc are small files. Both sides of Vancouver Island and Puget Sound is 1500 MB from one source as RNC, where as the same region covered by ENC would be about 100 MB or less. There are several sources for the Canadian echarts. The primary one is the Canadian Hydrographic Service (CHS) who actually make the charts. They in turn have licensed the rights to sell the charts to several other companies worldwide. CHS has also licensed them to be incorporated into proprietary GPS charting systems, but that is not the topic at hand.These are usually sold on cartridges that plug into the GPS units. For now we are discussing echarts purchased to be viewed and used in your own ECS system, meaning some echart navigation software program. (1) CHS price $175 each, sold separately for inside and outside. Runs in most programs that will run BSB4 format. (Will not run on Time Zero products). They seem to still include a chart viewer on the CD, but this viewer will not work on 64-bit systems such as Vista and Win7. (2) MapMedia charts $300 for inside and outside, sold together. These run on the new Time Zero ECS from Nobeltec and MaxSea. Includes 3d data and satellite images. They also include some inland waterways, and some related 3d and sat photo data. Both offer free updates for the first year. MapMedia plans to charge half price after that, and CHS plans to sell us a new set after that…. but both of these programs will certainly change. (1) CHS price is $600, for each side. Covers inside and outside, but there is not option but to include 3d data and satellite images. The extra products provided are not needed for navigation, but added in large part to justify the high costs for these files. These charts do not meet the ECDIS standards, nor other standards for vessels required to carry charts on board. In principle there is an advantage to the MapMedia vector chart base besides the price, in that they offer for sale vector charts from several sources, including Jeppsen and Navionics. Vector charts are not all the same (this is not one of their advantages over raster charts! ), so with inside information we can chose the ones that work best for a given region. MapMedia is a French company that is owned by the same company (Signet) that owns Nobeltec and Maxsea. Signet is jointly owned by Furuno-Japan and their French partner. We have several articles in this series about ASCAT. Search the blog on ASCAT to find them. "For completeness, we mention there is another way that you can customize this task using the powerful email service of saildocs, which is well known to many cruising sailors, although we guess not many are taking advantage of this powerful feature." This note is an explanation of that process. First we will need to know what file names cover the regions of interest. 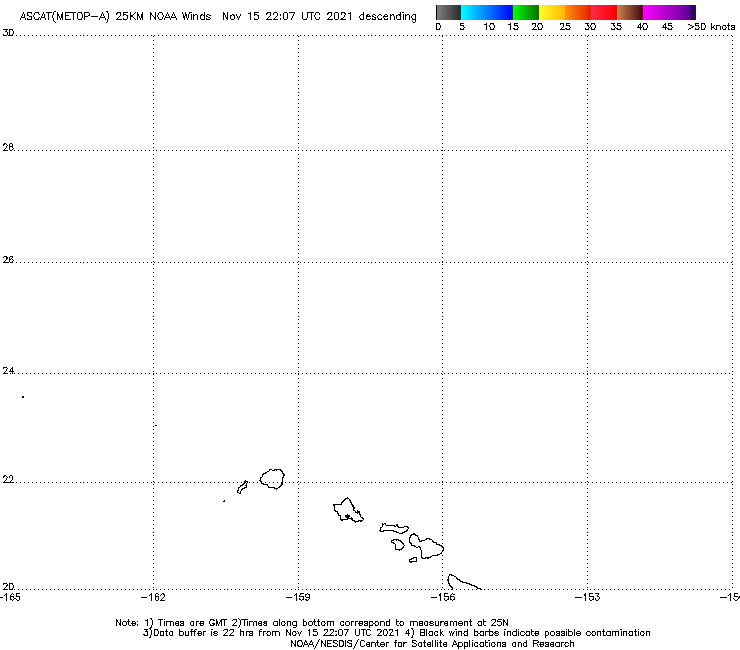 These are obtained from the graphic index at http://manati.star.nesdis.noaa.gov/datasets/ASCATData.php. Go to that map and put your cursor over the region of interest and note the file name in your status bar. There are two index maps, one for ascending passes, the other for descending passes. You will see the file names are very similar. The world is divided into small Lat-Lon grids of 10º x 15º in size. 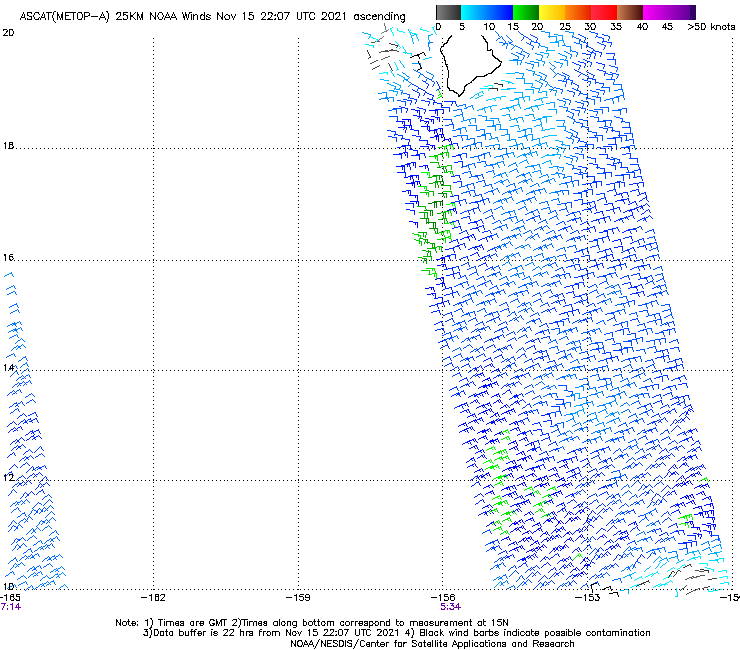 Then in a few minutes you will get the graphic image of the winds you want. This will always be the latest data, but the latest may be some hours old depending on latitude and time you ask for it. The trick is to make your own index of the regions you care about and you can ask for several in a row to get what you want. The 86 is identifies the region 30N-40N x 75W-60W, and the as vs ds identifies the pass, Ascending or Descending. The file size for this 25-km resolution will be about 35 kb. The larger overview at 50-km will be about twice as big. You can do this with any email access from your boat, or from home. We need to keep track of download fees when underway, which could be tied to file size or air time, depending on your system, SSB or sat phone. 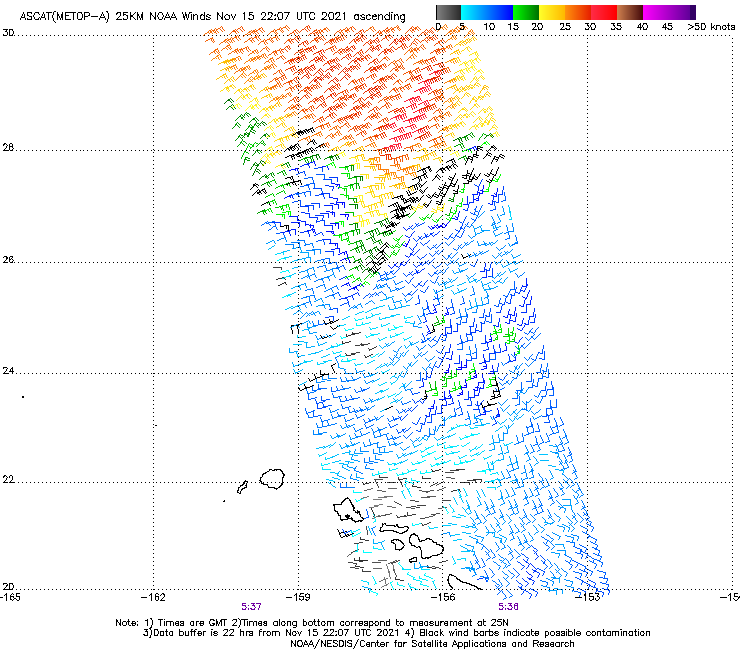 You can do this with any of the scatterometer data fields that are available at the site listed (ASCAT A or B and WindSAT), but for offshore use you need to plan this ahead on some level so you know the file names that will cover your route. Our new textbook Modern Marine Weather 3rd ed (July 2018) now includes a graphic index to these image map files, worldwide. With that index in hand, you do not need to go online to discover the file names needed. This technique from 6 years ago, however, still remains valuable, and we give it more emphasis in the text. Previously, it was only presented here. On the other hand, we can now get ASCAT data in GRIB format, and several viewers are capable of displaying it: LuckGrib (Mac and iOS), Ocens Grib Explorer (PC and iOS), and Expedition (PC). Data sources are covered in our textbook.